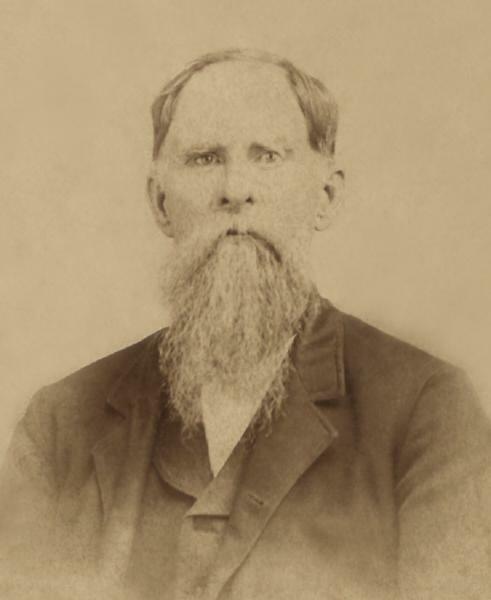 Eason Blue Wood was born on 3 April 1831 in Marble Valley Beat, Bibb County, Alabama. He and Henry Black Wood and Susannah Eugenia Wood accompanied Allen Wood and Delilah Clower to Fayetteville, Talladega County, Alabama, in circa 1834. Allen Wood and Delilah Clower appeared in the US federal census of 1 June 1850 in Hatchet Creek, Coosa County, Alabama. Other members of the household included Eason Blue Wood, Henry Black Wood, Mary Willis Wood, Peity Dodd Wood, Elisha Beecher Steadman Wood, Missouri Ann Pearson Wood and William Forrest Wood. He was a farmer, and also attending school, according to the 1850 census. He married Sarah Ann Barrett, daughter of James Howard Barrett and Elizabeth W. Parks, in 1861, and Eason's sister Missouri married Sarah Ann's brother John. Three children of Eason Blue and Sarah Ann Barrett Wood are buried at Pin Oak Cemetery in Hubbard, with undated markers: sons Welcome and Terry, and an unnamed infant son. They are buried in the same plot as Eason's mother and Sarah's mother. Captain Eason Blue Wood, of Marble Valley, Alabama, serving with the 34th Alabama Infantry Regiment, CSA, arrived as a prisoner of war at the Johnson's Island Prisoner of War Depot, Sandusky Bay, Lake Erie, Ohio, on 7 December 1863, and was released 13 June 1865. He was captured at Missionary Ridge, Chattanooga, Tennessee, 25 November 1863. Eason Blue Wood and Sarah Ann Barrett appeared in the US federal census of 1 June 1870 in Marble Valley Beat, Coosa County, Alabama, enumerated near the household of Eason's sister Missouri Barrett and his brother Elisha.. Other members of the household included William Alva Wood, John Howard Wood and Dixie Wood. Eason Blue Wood and Sarah Ann Barrett appeared in the US federal census of 1 June 1880 in Hill County, Texas, enumerated next to Sallie's brother John Barrett. Other members of the household included William Alva Wood, John Howard Wood, Dixie Wood, Eugene B. Wood and Joshua Wood. Also in the household was nephew William Jackson (age 25). He was a physician, according to the 1880 census. Eason Blue Wood became a widower at the 18 February 1895 death of his wife Sarah Ann Barrett. Eason Blue Wood died on 1 December 1907 at age 76. He was interred at Fairview Cemetery, Hubbard, Hill County, Texas. The following appeared on 2 December 1907 in The Waco Times-Herald: Word was received in Waco today of the death of Dr. E. B. Wood of Hubbard City, who passed away last night. He was the father of Eugene Wood, former registrar of Baylor university, and Miss Dixie Wood, at one time a teacher in the South Eighth street public school. The deceased was universally beloved and respected in the city where he resided, and the news of his death will be sorrowfully received by a score of friends. It is thought that interment will take place today at Hubbard City. The following appeared on 3 April 1951 in the Abilene Reporter-News: Funeral services for Eugene B. Wood, 79, a resident of Abilene 47 years, will be conducted at 3 p. m. Tuesday in Laughter-North Memorial Chapel. Mr. Wood, a retired real estate man, died at 8:15 a. m. Monday at his residence, 318 Butternut St., after a short illness. Born Sept. 15, 1871, at Goshen, in Henderson County, he had his first schooling at Bowman Grove, where his mother taught. His father was a pioneer Texas doctor. In 1884 the family moved to Waco, where Mr. Wood entered Waco University, now Baylor University, when he was 13. He was named the first registrar of Baylor University in 1893 and in 1895 he was graduated. He married the former Cora Warren of Abilene, a classmate at Baylor, in 1897. Mr. Wood was the first person to establish a scholarship at Baylor University, the Eason B. Wood scholarship, in memory of his father. Later he endowed a loan fund there in memory of his mother. An active member of the First Baptist Church, he continued active in the real estate business until his retirement about two years ago. Survivors include his widow; two sons, E. Warren Wood, sound technician for Paramount News at New York City; Carroll Wood, agency director for Great American Life Insurance Co. at San Antonio; one daughter, Mrs. Raymond Czichos of Wimberly, Tex; one sister, Mrs. J. D. Johnson, Hubbard, and six grandchildren. Dr. E. B. Atwood, retired Hardin-Simmons University professor, and the Rev. W. C. Ashford, will conduct final rites. Burial will be in the Oddfellow Cemetery. Active pallbearers will be Emmette Chandler, Harvey Brown, T. N. carsnell, Ennis Hollingshead, E. T. Walling, and Burl King. Members of Mr. Wood's Bible class at the First Baptist Church and old friends have been named honorary pallbearers.